I don’t know how many of you were fortunate enough to know your ancestors that emigrated to this country from a foreign land, but I was blessed to know my immigrant grandparents through childhood and into adulthood. 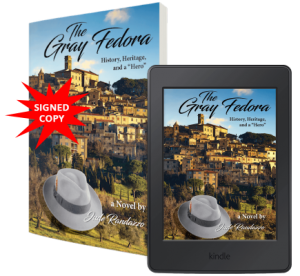 They told me stories of Italy and family alike; stories which inspired the creation of the book you have before you now — The Gray Fedora. Needless to say, I gathered many ideas from these memories. Looking through some family photos, I found a picture of my grandpop. I recalled a conversation he and I had forty years ago, about his own grandfather. 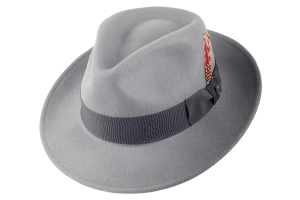 I remarked, “uh huh.” Imagining, at the time, nothing but a travelling bunch of rag tag minstrels playing mandolins and trombones and wandering around Sicily. It wasn’t until after he had passed away that I began to discover that Garibaldi was a gigantic figure in 19th century Europe. I also became aware that Italy wasn’t even a country in 1860. Garibaldi and several other key individuals led a revolution to unify Italy, a country I had always assumed had been in existence for a thousand or more years. And what a fascinating man and story, all non-fiction, it is! The man took trains and steamships to battles…really! His army fought and won battles that are hard to imagine and don’t exist in the annals of military history. It’s fascinating stuff, but when you throw in the details of his marriage to a woman with the female version of his own name, and the fact that on the night of their wedding she revealed to him that she was “with child” from another man, just adds another layer. In the end, after victory and unification Garibaldi went home with the spoils of war, a box of salted cod fish, macaroni, and a bottle of wine. And, he went home on another train. Garibaldi really was the true most interesting man in the world!